Texas! Where everything is bigger and our residents our brimming with pride! From the invention of the Bowie Knife, to the home of the legendary Rio Grande, Texas has plenty to be proud of. There are many things that we absolutely love about our Lone Star State but today, we’re going to be talking about all the FUN facts about one of the largest states in the country. Here are the 14 best! 1. Is everything really bigger? True to our stereotype of “everything is bigger in Texas,” the King Ranch legacy covers over 825,000 acres of South Texas—larger than the state of Rhode Island. Absolutely amazing. On this massive land, there is an abundance of cattle and horses, over 35,000 animals to be exact! Yes, you totally can book a time to visit this beautiful area of Texas. Time to boast our BOLD Texan attitude: The state of Texas was once a completely independent nation between the years of 1836-1845. Guess what our state animal is? Wait for it...it’s an armadillo! Looks like something that is a mixture between reptile and mammal, but this interesting looking creature is purely mammal! Do you know about the city El Paso, Texas? Well...you’ll be boggled to find out that our Texan city El Paso is geographically closer to Needles, California than it is to Dallas, Texas. Do you even know what a Whooping Crane is? Well...the Aransas Wildlife Refuge is the winter home of the nation’s only remaining flock. Texas is rich in many things...Helium being one of the pricy natural resources of the world these days. Amarillo holds the largest helium well in the entire world! What else are we awesome at? The highest production in crude oil, leading cattle and cotton producer, and the highest speed limit in the nation—boy, do we know how to live! Did you know that Dr. Pepper was invented right here, in Waco, Texas? Pay a big thank you to pharmacist Charles Alderton for creating such a tasty beverage all the way back in 1885. The very first domed stadium in the United States was built in Houston, TX n 1965. The Rio Grande River that stretches 1896 miles throughout the state of Texas is the largest in the state! The Bowie knife was deemed so after Alamo war hero Jim Bowie. Jim’s brother was the one who actually designed the knife. Our great state owns all its own public lands. Should the government ever wish to create refuges, parks etc., yhey must first ask the state’s permission to do so. Our beautiful Texas flag’s colors represent: Red for courage, blue for loyalty, and white for liberty. 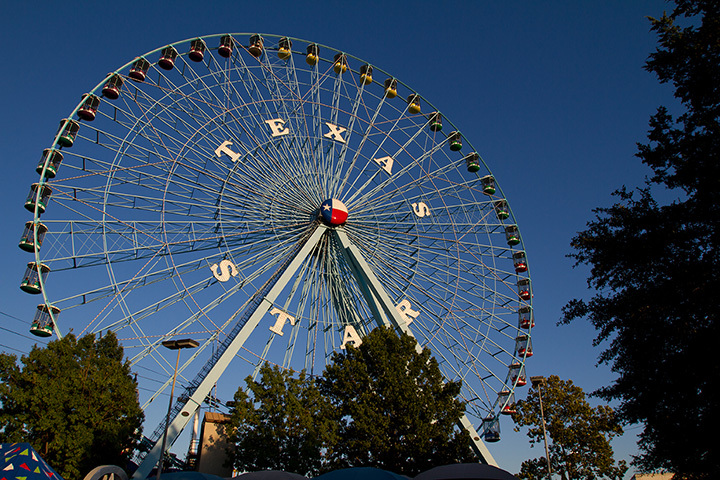 The Dallas State Fair is home to the largest Ferris Wheel in the Western Hemisphere—the Texas Star. Boy, there sure is a lot to know about Texas! Almost like how you realize it takes forever and a day to drive OUT of the state of Texas to road trip it anywhere, we could never run out of fun facts about this state!